I definitely did not see that coming. I won't say what it is here, even behind spoiler tags. I'll just say this: do not skip to the end or any nonsense like that, do yourself a favour and read the episode from its first page as the author intended. Then come back here and argue about whether it's the best moment in 2018. I'll review the rest of the prog when I've read it, in half an hour or so. *A figure of speech: I was already lying down, I'm still in bed. All done! A very good prog this week. A ridiculous Dredd one-off by Rory McC and PJH. Brink is as good as usual. Sinister Dexter has a double-length conclusion, and I really enjoyed the dialogue between the workers. This is what SinDex should be like. The cover is by Chris Weston, and although it goes without saying, I'll still say it anyway: it's brilliant. Is that the end of Kingdom or just this book? I mean, it's a good end – and a powerful end. But is that it? Well I'm a traditional front to backer, but spurred on by Richard's comments I stopped doing the dishes as soon as the postie arrived and went straight to Kingdom. If that is the end, and I think it is, though there are a couple of ways it could continue, its bloody magnificent! A perfect ending. That said we've talked around these parts a lot of late of the number of long running strips that have no sense of ending anytime and just drift on. A number of us (and I count myself amongst them) have called for some strips to wrap up before new stuff lands... well a classic case of 'Careful what you wish for'. Kingdom isn't a strip I feel needs to end. In classic 2000ad style it feels like one that has space to run and run and still be fresh and interesting, something this series has proved. But this episode felt to me like a full stop. If it is 8 books over 12 years of prefect 2000ad thrillpower. This strip started just as I got back on board and feels like my strip, the one that perfectly encapulates how a feel about the Prog when I first read it in 1977 and what means so much to me about the Prog now. Richard Elson and Dan Abnett I salute you. It certainly feels like it's done, with the hubris of the humans being shown up for what it is, the ongoing escalation of warfare, and Gene recognising he needs to look out for himself and not the Masters. Even so: it's rather bittersweet, in that the hero survives, albeit in a world where the bugs look like they'll reign supreme – and if they don't, it will be because of further escalation. Well after Kingdom the rest of the Prog should be an anticlimax... but of course current 2000ad has none of that. There's a solid fun, Dredd by McConville and Holden. Looks great but lets be honest not quite on Small House standards. Brink of course continues to be absolutely brilliant, just brilliant. But after Kingdom its Sinister Dexter that's the star of the show. A really fun conclusion to this fantastic 2 part 4 parter, Sinister Dexter at its best. Dabnett really does rule the thrills these days! 2019 going to have to real put in a shift to live up to the latter part of 2018! 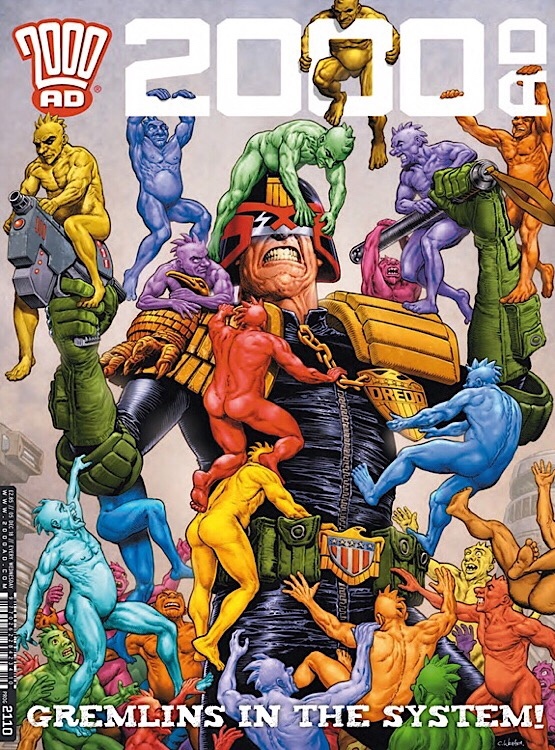 It's almost s shame Dabnett didn't do this week's Dredd too. Kingdom could end right here and it would be a totally fitting ending. But I think there's still room for it to continue, and I would be happy to see it return. Then come back here and argue about whether it's the best moment in 2018. I'm going to argue against it, sorry. I mean, there is quite a bit of power in it but at the same time there is so much left wide open. To me it felt like the writer just decided ... "well, that's it, I'm done. I'm off." ... and just gave us a wrap up episode. Granted it's not in the same league as Lost but it still felt deeply unsatisfactory on one level to me. ... but then is that the whole point? As readers we are always in a position of wanting that little bit more but some stories don't really have a proper 'ending', just an ever escalating cycle that characters have to endure? I'm minded of something that I read once (I think, in Steven King's Talisman) about the story always continuing in the readers' mind. In this current environment in which so much of the past is plundered, pillaged and raped for material is there not something to be said for leaving the next part of the story up to the reader? Okay, lots to think about here. To be fair, episode 11 seems to be about the right time for a wrap-up episode. It certainly seems to be the last ever episode of Kingdom given the comment about Gene, Lee and Pause having a lifetime of struggle. I know it has been hinted that this was the last series but it still seemed a bit abrupt, especially the sudden appearance of the super evolved version of Them. Overall Kingdom is a series that has really grown on me, to take its place as one of the all time top thrills. Brink continues to be awesome. Dredd was very lightweight compared to the Small House. I thought the ending made sense. Everything just kept escalating, and at some point there needed to be a slam-dunk. We got that. And, yes, it was abrupt, but kind of like the winning punch in the eighth round of a boxing match. A tremendous cover, probably in my top five of the year. This week's Dredd, a suitably silly one off nicely easing off the intensity we've been recently enjoying. Brink as always is perfection, SinDex pretty much the same. I can't see Kingdom finishing here, not like this. I hope not anyway. A super prog, this run since 2100 probably the best in recent years. The xmas prog cover teaser a treat, in particular JD's naughty list arrest warrant naming what I assume are the children of everyone working in the nerve centre. Wonderful!